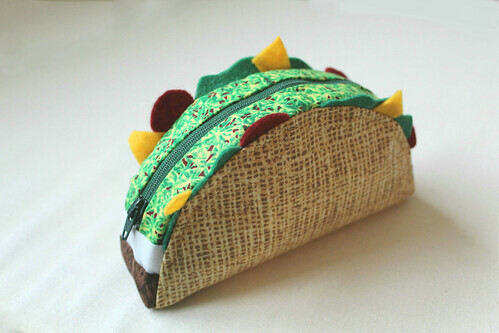 Today I am so excited to present Melissa, from Mahlica Designs with a cool and easy Taco Zipper Pouch project! Quilting cottons in taco shell tan/yellow, lettuce green, sour cream white, & taco meat brown. 4 x 4in squares of felt in tomato red, lettuce green, and cheesy yellow. Heavy weight fusible interfacing; 7in zipper, and basic sewing supplies. Apply the fusible interfacing to the corresponding wrong side of the tan shell pieces. Measure and mark 1/2in beyond the top and bottom zipper stops and trim away the excess zipper tape. Mark the seam lines along the corners of the rectangle tan piece. 1/2 inch seam allowance used throughout. Press as needed after each step. Match up long edge of green fabric with edge of zipper tape (right side of fabric facing top side of zipper) and stitch next to the zipper teeth. Repeat for the other side. Sandwich and center each end of the zipper strip between the white pieces. Right sides of the white facing each other. Stitch, being careful to avoid the zipper stops. Sandwich and center each end of the zipper strip between the brown pieces. Right sides of the brown facing each other. Stitch. 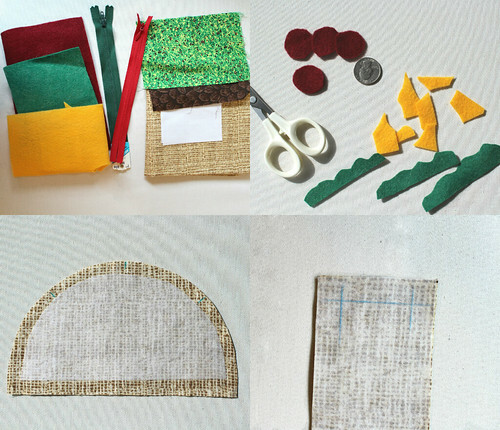 Trim & square up the long sides of the zipper strip to a total finished width of 2.5in. Place your felt toppings on the right sides of the tan shell pieces, making sure the toppings are pointing toward the center of the shell pieces, and that they will be caught in the seamline. Pin in place. Right sides together. Place the long edge of the zipper strip along the curved edge of the shell piece. Pin in place and stitch. Back stitch at each end. Unzip your pouch if you haven’t already. Repeat with the second curved shell piece. Topstitch along the seamline, catching the seam allowance beneath the tan fabric. Use pinking shears to trim the seam allowance if desired. Right sides together, stitch the long edge of the remaining tan strip to the long bottom edge of the shell. Starting and stopping at the corners you marked and backstitching. Make sure your zipper is open. Repeat for the other long side. Now stitch the short ends of the zipper strip and the tan strip closed, right sides facing. Starting and stopping at the marked corners. Backstitch. Use pinking shears to trim the seam allowance if desired. Turn right side out and gently push out your bottom corners. You’re finished! Now everyday can be Taco Tuesday.